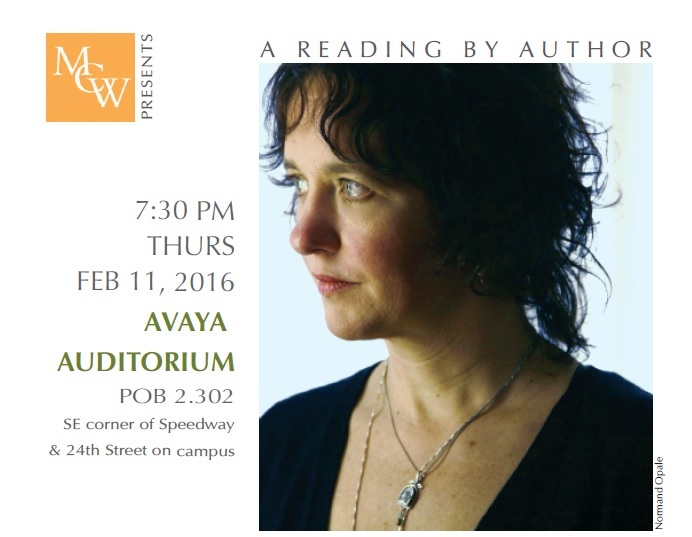 The UT Michener Center for Writers will host a reading by poet and novelist Laura Kasischke on Thursday, Feb. 11 at 7:30 p.m. in the Avaya Auditorium, POB 2.302 on UT campus. Kasischke is the author of nine acclaimed books of poetry, most recently The Infinitesimals. She won the 2011 National Book Critics Circle Award in Poetry for Space, In Chains. She has also written nine novels, three adapted to feature film: The Life Before Her Eyes, starring Uma Thurman and Evan Rachel Wood; Suspicious River; and White Bird in a Blizzard, which premiered at Sundance in 2014. Her collected stories were published in If A Stranger Approaches You. She is the endowed chair of English at the University of Michigan, where she teaches in their distinguished MFA program. This entry was posted in Literary Events and tagged Laura Kasischke, Michener Center by Jessica Sinn. Bookmark the permalink.